Hayes Jewelers was started in 1939 as a small family jewelry store in Lexington, North Carolina by the late Delmar Hayes. Since that time, the store has grown to one of the largest diamond superstores in the Southeast. 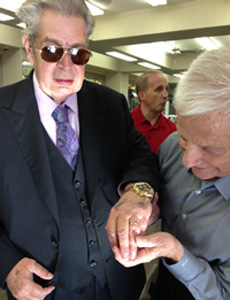 These days Delmar's son, Bruce Hayes, "The King of Diamonds", oversees this jewelry operation. After finishing at Wake Forest University, Bruce followed his father's love of the jewelry industry. He moved to New York City and worked for Keepsake Diamonds, where he gained invaluable experience in the art of buying and selling diamonds. He moved back to work with his dad in the store. After his father's death, his son Zack joined him in the business. That was in 1983 after Zack graduated from Wake Forest University. Zack also went on to the Gemological Institute of America where as a Graduate Gemologist he received several advanced degrees in Diamonds and in Colored Stones and Gem Identification. Zack continues his education with the Laser Star School in Florida and the Ray Martin Jewelry Repair School in Ft. Payne, Alabama. Hayes Jewelers is a family business still run by the Hayes family to this day. The Hayes Family has also been involved in the world of stock car racing since the 1940s when Delmar Hayes began sponsoring drivers, teams and events. Over the years, Hayes Jewelers has fielded legends like Richard Petty, Dale Earnhardt and many others like Ralph Brinkley who won 64 times at Bowman Gray Stadium and Tim Brown, who has won 68 times. NASCAR has recognized Hayes Jewelers as the longest-running sponsor of the sport, having sponsored consecutive events at Bowman Gray Stadium in Winston-Salem, NC for over 55 years. In 2014, NASCAR'S Allison Family Corporate Award Given In Memory of Clifford & Davey Allison was awarded to Bruce Hayes and Hayes Jewelers for their commitment to the sport of NASCAR racing. "We've been a part of NASCAR from the time they started in 1948 as far as sponsorships and things like that are concern. I think it was a great gesture on their part to honor us," says Bruce Hayes. 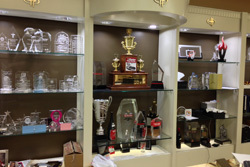 Hayes Jewelers has been designing trophies for NASCAR for over 50 years. Throughout the Winston Cup Series, Hayes Jewelers designed the trophies, as well as trophies for other well-known companies such as Coca-Cola, Advance Auto Parts and Powerade. 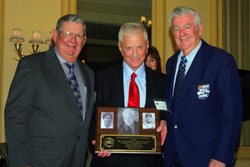 Bruce Hayes was also inducted into the Carolinas Boxing Hall of Fame in 2011, where he also received the Floyd Patterson Lifetime Achievement Award. As a young man growing up in the Erlanger Mills neighborhood of Lexington, NC, Bruce got into boxing. He went on to win several matches, including the Golden Glove awards. Later, he and his father would sponsor several young men in boxing matches, as well as the local boxing matches themselves. Over the years, Hayes Jewelers has been the choice for many celebrities and stars. Richard Petty, Jeff Gordon, Dale Earnhardt, Dale Jr., Richard Childress, Junior Johnson, Kyle Petty, Bobbie & Donnie Allison, Burt Reynolds, Eric Braeden, Mugsy Bouges, Chris Paul, and "The Old Man" from Pawn Stars have all made purchases from us. But we know that the real stars are our local customers who have become a part of our family over the years.